Leadership at Church of the Ascension is a collaboration of clergy, staff, and volunteers (known in church jargon as lay leaders). Read about Clergy directly below. Click here to read about Staff and Lay Leaders further down the page. The Rector has day-to-day supervisory responsibility for the church and is our liaison with the bishop of the Anglican Diocese of Huron. Our current rector is Rev. June Hough, and she is assisted by two retired clergy. Ordained in London, Ontario, in 1986, I have served in churches in the Dioceses of Huron, Nova Scotia and Ottawa. 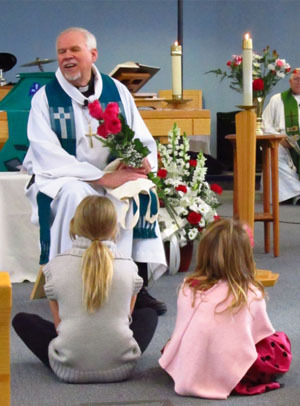 My ministry has been as rich and varied as the parishes I have served. When I got ordained, I was a young single woman of 27. As my ministry progressed, so did the size of my family. I now have a busy household of seven. The addition of my husband, three children, and two dogs has been a blessing, and my parishes have been an extension of that family. Society is changing; the Church is changing. People are spiritually hungry and it’s important to find a place where questions are welcomed and love is shared, to find communities that are welcoming instead of judging, that celebrate instead of droning on about “what we used to do.” My hope is that you find that here at Ascension — a place where the Spirit is moving. I’m a long way from the parish of my childhood in Kirkland Lake, Ontario. But I have found no matter where I go, I can always find a community of God’s people and suddenly I ‘m not so alone. I was born in Florence, Ontario. Dad was an Anglican priest. I felt strongly early in my life that I had a call to ministry, but the experience of being a P.K. (preacher’s kid) discouraged me from the idea. It was hard as a kid to know every transgression you committed was known at the rectory before you could get home. I have worked as a farm labourer, a warehouse receiver, a lineworker at Chrysler’s, a tunnel maintenance worker, an aircraftman with the RCAF (radar), an officer with the Canadian Army, a medical attendant on a psychiatric ward, a teacher in nursing schools and a community college as well as community worker, a property manager and a banker. I went back to university and got my bachelor’s degree with honours. I went to work with the Windsor Housing Authority first as Community Relations Worker and then as a Property Manager. It was during the training for that work that God called again in no uncertain terms. I could no longer deny what I had felt when I was a child. I finished my Master’s of Divinity at Huron in two years. Pat had become the Director of Perioperative Nursing in St. Joseph’s Hospital in London. I spent my first two years in ordained ministry as the Assistant Curate for Bishop Cronyn Memorial Anglican Church in London. In 1980, I became the Rector of Holy Trinity, Lucan, with St. James’, Clandeboye, and stayed there until the end of June 2003 — the longest-serving Rector of that parish. After retirement from active ministry, I came to the then-new East London Anglican Ministries (the original name of Church of the Ascension). I guess having come into the ministry at such a late date, I still have much to do to catch up to the years I spent apart from the work that the Lord had called me to so long ago, but if the truth be known, I love ministry, I love the people, I love the message, I love the Lord and it is my honour to serve as an Honourary Assistant here, and a genuine privilege to serve you all. What’s a Lutheran doing on the clergy team at Church of the Ascension? It’s really quite simple. The Full Communion agreement between the Anglican Church of Canada and the Evangelical Lutheran Church in Canada makes it possible. This accord, known as the Waterloo Declaration, was signed in Waterloo, Ont. I retired from full-time ministry in April 2011 after 39 years, the last twelve at Trinity Lutheran Church in London. Church policy required that I leave Trinity to clear the decks for a successor. After a couple months of “church shopping,” my wife and I visited ELAM, as Ascension was then known, and there has been no looking back. Warmly welcomed, we felt right at home from the first Sunday. When Rev. June Hough asked me to serve as an honourary associate, it was, so to speak, the icing on the cake. I was ordained in Ohio Synod in 1972. I served rural parishes in Ohio for nine years, before being called to the Eastern Canada Synod of the Lutheran Church in 1981. 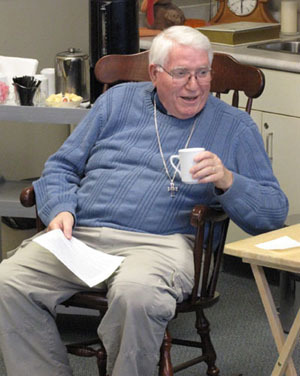 I served Northern Ontario parishes in Massey and Sault Ste. Marie, where I was involved in many joint Anglican-Lutheran projects. My parish, Zion Lutheran Church, and neighbouring St. Matthew’s Anglican Church were specifically appointed by our bishops to be pacesetter congregations in the on-going Anglican-Lutheran dialogue. That led to joint worship services, pulpit exchanges, and joint youth activities. I was named an ecumenical canon of the Diocese of Algoma in 1999. Hanging with Anglicans is nothing new to me. I have a B.A. in Sociology from the Ohio State University, and an M.Div. from Wittenberg University. I am an active member of the Kiwanis service club, where I have been a Distinguished Lieutenant Governor. My wife Sue and myself were married in 1968. She is a retired French teacher. It’s a joy to be able to continue in ministry in our new church home at Ascension. Our church office is staffed by the parish administrator Tuesday to Thursday, 9 a.m. to 1 p.m. from September to June. Voice mail at 519-451-7780 is available 24/7 for you to leave messages. We also check the e-mail at office@ascensionlondon.com regularly. The office phone or email are good ways to contact the lay (volunteer) leaders of the church. The Executive Team is composed of the Rector, Wardens, Deputy Wardens, and the Treasurer. One Warden and one Deputy Warden are elected by church members (the “vestry”) at the annual vestry meeting and one each is appointed by the Rector. The treasurer is appointed by the Wardens. Together they are responsible for the Church and all that happens within it. The Executive Team meets monthly in private to handle a number of issues, including financial and legal matters. The Wardens and Deputies make announcements on Sunday mornings. Parish Council is composed of the Executive Team, Lay (non-clergy) Delegates to the Diocese of Huron Synod (parliament) and Alternate Lay Delegates elected by vestry members, as well as other lay people in the church, some elected by the members and others appointed by the Rector during the Annual Vestry Meeting. Parish Council meets monthly from September to June to discuss and vote on issues, hear reports and implement ideas. These meetings are open to anyone.